Nestled on the banks of the Perfume River, the city of Hue remains most famous as the former home of the Nguyen Dynasty, the influence of which remains evident in local palaces, temples, forts, and museums. Hue is known for historic sites, scenic drive, nature, nightlife, and spas. 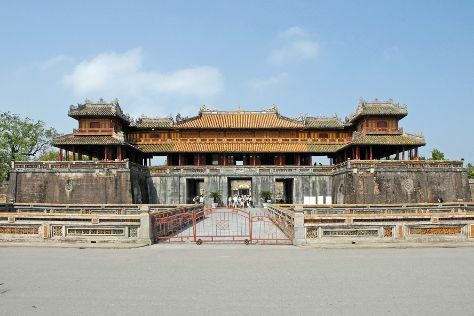 Your plan includes some of its best attractions: contemplate the long history of Hue Imperial City (The Citadel), make a trip to The Noon Gate (Cua Ngo Mon), go all around town with City Tours, and admire the striking features of Thien Mu Pagoda. For where to stay, reviews, traveler tips, and other tourist information, read our Hue custom trip planner. If you are flying in from Canada, the closest major airport is Da Nang International Airport. In November, daily temperatures in Hue can reach 32°C, while at night they dip to 26°C. Finish your sightseeing early on the 18th (Sat) so you can travel back home.